Grim Sickers isn’t your average grime MC. Born in Bristol with a half-Indian and half-Jamaican heritage, he burst onto the scene in 2013 as part of Lord of the Mics V, taking part in one of the series’ most entertaining clashes. Since then, he’s worked tirelessly to establish himself as one of grime’s most unconventional and distinctive voices, appearing on tracks and sets with other up and coming MCs as well as going bar-for-bar with grime legends such as Ghetts, Jammer and Discarda. Making the transition from pirate radio regular to stageshow don, Grim Sickers quickly became known for his electrifying live performances, lighting up stages across the country with his inimitable energy and enthusiasm. Grim Sickers has also carved out a reputation for writing memorable hooks and rhyme sequences, peppered with pop culture references, a dark sense of humour and incredible detail. 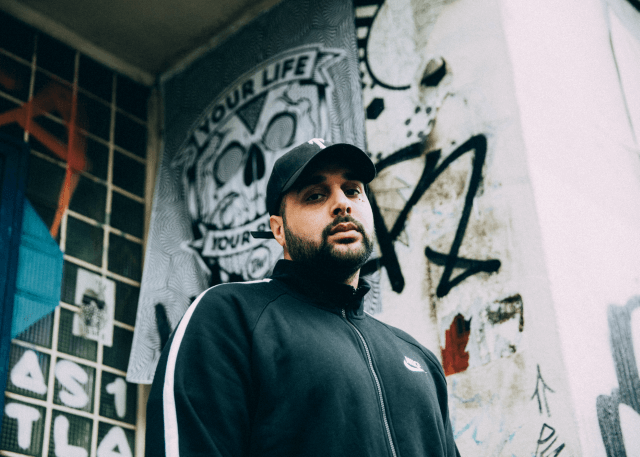 His biggest success so far has been “Kane”, the Swifta-Beater-produced single released on the label of Birmingham creative Despa Robinson and legendary The Streets frontman Mike Skinner. The track went on to be featured as KISS FM’s Track of the Week, as well as being spun heavily on Radio 1Xtra and more. Whether it’s on air at 1Xtra, Rinse FM or Radar Radio, onstage at festivals, raves in the UK or as far-flung as the Czech Republic, you can expect to see plenty of Grim Sickers in the future, dressed head-to-toe in black with a mic in his hand, delivering bar after bar with the swagger and presence of a WWE superstar cutting the promo of his life.